If you have some calibration or move command problems, and if all the belts are correctly tensed, you might want to check the timing pulleys fixed on the stepper motor shafts. If a timing pulley is not correctly fixed to a stepper motor shaft, the motor may just rotate inside the timing pulley, and thus the belt will not move, even if it is correctly tensed. To tighten a timing pulley, use a small allen key and tighten the 2 screws as shown below (axis 2). You can do the same thing for axis 1 and axis 3. 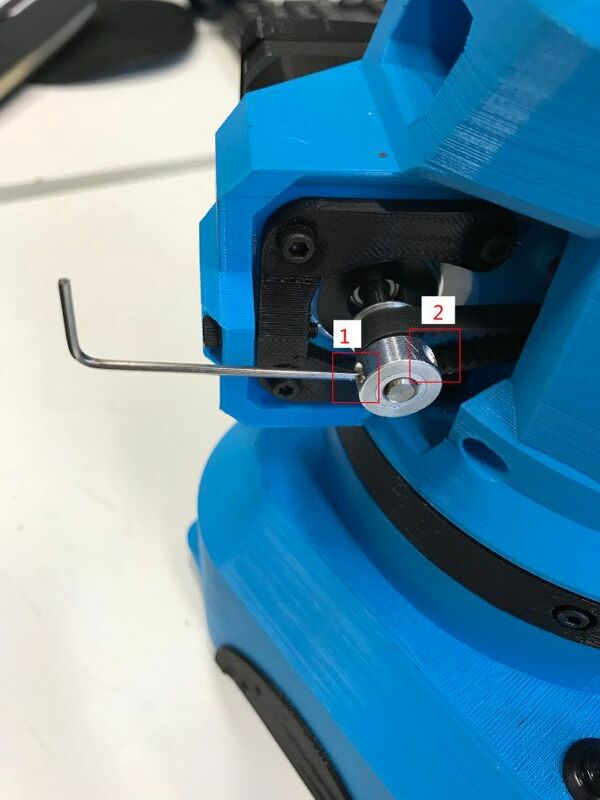 If, after tensing the belts and fixing the timing pulleys, you still have the same issue (calibration or move command problem), then the next step is to check if a magnet is not correctly centered on a stepper motor shaft.